You just joined a gym with hanging heavy bags or you made the investment in a sturdy and durable free standing punching bag. You’ve got the equipment but you are missing the instructions and workout. Here is the breakdown of the four most common boxing techniques along with a workout to get you started. The starting stance is absolutely critical as it is the foundation for all of the basic boxing combinations you will use during training. This is a right-handed stance, which means you will be leading with your left side and the power hand will be in the back. •	Stand tall with feet shoulder width apart. •	Shift the left side of the body forward. •	Keep the knees slightly bent at all times. •	Lift the heel of the rear right foot. •	Bring hands to the face. •	Keep the shoulders and elbows down. •	Extend the left arm forward. •	Ensure the wrist is straight throughout. •	Keep a slight bend in the elbow. •	Pivot from the rear right foot by twisting all the way up through the right leg and hip. •	The pivot and twist will lead into the punch. •	Keep the left arm up for protection. •	Keep the elbow slightly bent. •	Pivot on your left foot. •	The left arm will travel horizontally across the body. •	Maintain the elevated elbow across the center line. •	Keep the right hand up for protection. •	Dip down as you pivot on the right foot. •	Bring your body and power upward in a forward motion. •	Lead with the right hand. •	Connect with the center line and continue driving upward. •	Keep the left hand up for protection. 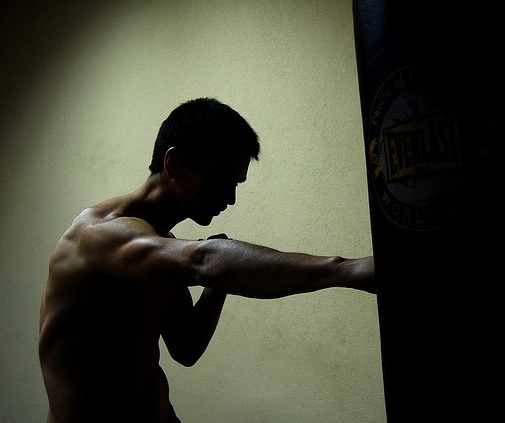 If you have never done any heavy bag workout before, I would recommend shadow boxing in front of a mirror for 10 minutes before moving over to the bag. Use circuit style training. Complete each exercise then move on to the next one. Once you have completed the list, take a break and begin again. Perform this heavy bag workout circuit between 2 and 5 times based on your fitness level. Be sure to include a light warm-up of jump roping, jogging, or shadow boxing.